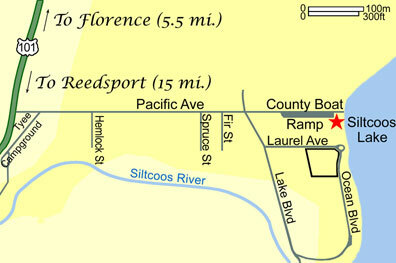 Easy Access To Siltcoos Lake. The easiest access to Siltcoos Lake is in Westlake, Oregon, approximately 6 miles south of Florence and 15 miles north of Reedsport. There is a well maintained Lane County boat ramp that provides a year-round boat launching facility. There is no fee for launching your boat, but there is a parking fee of $3 per day. You may also obtain a Lane County Parks Annual Pass. There are also public restroom facilities and enough parking to host even large groups and fishing tournaments. Please be courteous to other people using these facilities. From Florence, proceed south on Highway 101 past Honeyman State Park, Frontier Theme Park and Woahink Lake. Westlake is the second major turn off after you pass Honeyman State Park. Watch for signs marked "Westlake Area" and "Tyee Campground." Turn left on Pacific Avenue and proceed east to the stop sign. Proceed straight ahead into the parking facility. Once in the parking lot, stay to the right. The boat ramp uses a counterclockwise access route. Welcome! From Reedsport, proceed north on Highway 101. After approximately 15 miles, watch for signs marked "Westlake Area" and "Tyee Campground." Turn right on Pacific Avenue and proceed east to the stop sign. Proceed straight ahead into the parking facility. Once in the parking lot, stay to the right. The boat ramp uses a counterclockwise access route. Welcome! Siltcoos Lake... on the beautiful Oregon Coast. We continue to be dedicated to the conservation of Oregon Sports Fishing.